EA Sports has backed away from plans to release a sequel to last year's MMA game, indicating that the game's future is now up in the air. 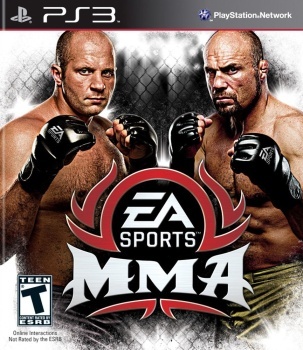 EA Sports MMA didn't exactly burn up the sales charts when it launched in October 2010. It was bad enough that shortly after it came out, analyst Doug Creutz declared it "dead on arrival" and predicted that EA would drop the title altogether. A month later, producer Jeff Ecker denied that prediction, saying, "There is definitely going to be an EA Sports MMA 2," but it's starting to look like he might have been a little premature. The number one problem is not a lack of interest, however, but the fact that Strikeforce, the lead promotion in EA Sports MMA, was acquired in March by the UFC - and the UFC has had some rough history with EA Sports. UFC President Dana White declared in July 2009 that he was "at war" with EA over its earlier rejection of a proposed MMA videogame and went so far as to warn that any fighter who took part in the game "won't be in the UFC." That antagonism is problematic for the future of the game. "A world where we're not involved in fighting is a world I'd rather not think about. That said, what goes on in the sport, and what's gone on between the UFC and Strikeforce, certainly has an impact on what we can do in the space," EA Sports Chief of Development Andrew Wilson told Kotaku. EA could presumably build a new MMA game around a different promotion but as a brand, Strikeforce is already a far less well-known to mainstream audiences than the UFC. Building around an even more obscure promotion and fighters who would be effectively anonymous probably wouldn't do much to help the series gain ground on THQ's UFC: Undisputed games. "So it's not a 'no,' but it's also not a 'yes,'" Wilson said. "We'd love for there to be one because I'm a diehard fan of the sport. We have to figure out how to make that happen."